Different city, different country, different customs and ideas. We sometimes go too far in the other direction, with parents hovering over their children, watching every move. Where’s the balance? I can see why you took the photo, it shows everyday life well. Some years ago, a professor from Princeton went to Viet Nam to study traffic problems, and he was killed there in a traffic accident. That is remarkable. I hope we could at least say he was doing what he loved but no, that seems wrong. A horrible way to go. Speaking of Vietnam, I’m very curious about your reaction to the Ken Burns special, if you saw it. It is probably too big a subject for right here, so I understand if you don’t want to go into it. I didn’t want to watch Ken Burns’ special. I think it was a rehash of all the untruths or half-truths which have received widespread dissemination of the past 50 years. That seems a little dangerous. Thank goodness she was not hit. She could have easily lost her footing while climbing the divider, and then what? As I mentioned below, traffic in Viet Nam accounts for more deaths than anything else. What a dangerous pursuit by the mother. I can understand why this picture stayed with you. Thanks Tiny! I was telling our driver to slow down or stop, but he completely ignored me. Can’t believe they climbed over the barriers,hope they were enough gaps provided for the pedestrians.Most apt image for the challenge,Hien. One has to see it to believe it, Doda! They have to learn not to build roads that divide towns into two, without allowing for pedestrian overpasses. 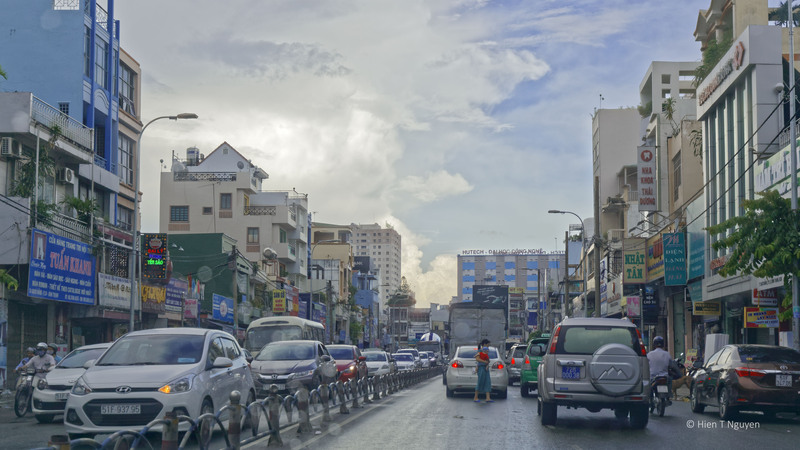 When we were in Thailand, one day our taxi driver made an u-turn on a not-too wide, and very busy street. It was a two-lanes street, and there were cars in front of us, cars behind us, cars coming from the other direction… Too my surprise, no one honked the horns. Wow, that is stunning. No wonder Thailand has the second highest rate of traffic fatalities. I’ve heard about how crazy and crowded Vietnamese streets are so being a pedestrian on one must be a challenge and dangerous. Great photo. Somehow people get used to that, but that crazy traffic is the biggest cause of deaths in Viet Nam.